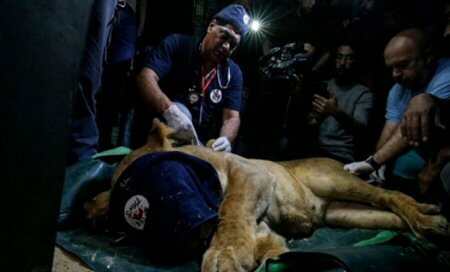 Dozens of neglected animals were evacuated from a ramshackle Gaza zoo on, Sunday, in the fourth and largest such rescue mission in the blockaded Palestinian enclave. Vets and volunteers from Four Paws International transported some 40 animals, into Israel, from the neglected zoo, located in the southern town of Rafah. The animals, including lions, foxes, monkeys, pelicans, wolves and ostriches, will be resettled in sanctuaries in Jordan and South Africa. Many of the animals were smuggled into Gaza via tunnels beneath the southern border with Egypt, which, along with Israel, has blockaded the territory since the militant Hamas group took power there in 2007. The blockade, along with three wars between Israel and Hamas, have made life miserable for Gaza’s two million residents, AP/Al Ray reports. Animals kept in captivity have suffered from a combination of neglect and lack of resources, on the part of zookeepers. Some died of cold and hunger, in makeshift zoos, as keepers failed to provide adequate care, while others were killed during the 50-day war in 2014. Four Paws International has carried out four rescue operations and has sent numerous medical missions to treat animals and birds in Gaza. Two other zoos have closed since Four Paws removed their animals, while animals are still being held under poor conditions, at three other zoos. The latest evacuation was scheduled for last month, but a round of cross-border violence between Israel and Gaza militants forced the organization postpone it.